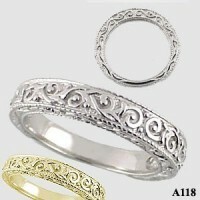 Stock #PLA118:This gorgeously detailed Antique Style Fancy Engraved Wedding Ring is sure to catch anyone's eye. This piece is 4 1/2mm wide, and VERY heavy. This item is made in solid 950 grade Platinum by hand, and has impeccable detail. The picture does not show the true sparkle of this ring. Matching Engagement ring available. Makes a gorgeous Wedding Set. Also available in 14k White Gold or 14k Yellow Gold.